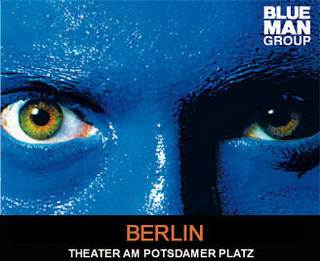 All went really well in Berlin for the Blue Man Group audition… even though I didn’t get the part it was a brilliant experience and it was very cool to have taken part in it! Things are moving along nicely at the moment… not too hectic which makes a nice change! Andreas Wendorf over at Jamba sent me a link to a very interesting site called openBC… for those of you who haven’t heard of it, it is well worth checking out… great networking site! Things are hectic again in my neck of the woods… not only have I been busy with the aforementioned projects for the past week… I was contacted yesterday by the Blue Man Group in Berlin to see if I would be interested in trying out as a “Blue Man” this Monday… even though things are crazy right now, of course I managed to reschedule next weeks events in order to allow me to fly off to Berlin… it’s pretty exciting as I have been a fan of their show for some years now… even just the opportunity to try out for their show is an honour! Time just seems to be flyyyyyyyyyyyying again… hard to imagine I used to blog everyday lol! Manfred Tari of Pop 100 and I will be working together on a project. I can’t be very specific as to what that project is at the moment for obvious reasons… this much said: it will be an online venture. Apart from that, British band ‘Psapp’ have expressed interest in working with me on their live set. I am looking forward to seeing if some kind of collaboration will take place as their music is truly beautiful… to see what I mean check it out their new music video. For the moment my blog is taking over the official NEWS section of beatkitchen.de due to a few site maintenance issues that are currently being resolved…. For the past few days I have taken a break from my ongoing sample CD project in order to remix Nine Inch Nails‘ soon to be released single “Only” from their latest album “With Teeth”. I am uploading my finished version as I write this blog… so for those of you who would like to check it out click here to be taken to my Phase Transition myspace account. There are quite a few other things that are bubbling away in terms of new career opportunities and I am sure that within the next few weeks there will be something more concrete to write about… until then, watch this space!